I recently laid out my argument for the constitutionality of the individual mandate. Conceding that I’m not a constitutional lawyer, it’s entirely plausible that I’m influenced by the consequences of the policy. I think Obamacare is better than not having Obamacare. I think the individual mandate reasonably solves adverse selection in insurance and the free-rider problem. In contrast, people who think Obamacare is bad policy also just happen to think it’s unconstitutional. [T]here are vanishingly few people who believe that the Affordable Care Act was a terrific piece of legislation except that it is unfortunately unconstitutional. Nor are there more than a handful who believe that the ACA is certainly permitted by the Constitution, but is otherwise a terrible idea. So let’s put everyone to the test – not just with healthcare but with every policy. Can you name any policy you favor but think is unconstitutional? On a recent episode of Up with Chris Hayes the panel discussed atheism in America. Richard Dawkins provocatively suggested that there isn’t too much discussion of religious beliefs in the public square, but too little. Dawkins believes that private religious beliefs should be subjected to the same scrutiny as any other belief candidates may hold. Hayes, an atheist, strongly disagrees and emphasizes that private and public beliefs are separate because “no one is legislating on transubstantiation.” I don’t need to check the legislative calendar to know he’s right, but I’m not sure that means we should “respect a distinction between beliefs on public matters and public policy and private beliefs.” Superficially, the distinction makes some sense, but practically we run into difficulties. Now, maybe Chris Hayes himself has never brought up any private issues. That’s a respectable position, but the media as a whole doesn’t seem to honor that distinction. “Character issues” either matter or they don’t. Sheltering religious beliefs from criticism is purely convention and cowardliness. Arguably, all the “private” issues that the media currently discuss are far less consequential than a candidate’s faith. Turns out that really caring about drawing heavenly images is why we see deadly riots after Danish cartoons. How strongly you feel about the second commandment will probably affect your response such controversies. It wasn’t that long ago that no one ever talked about stem-cell research. But again and again as technology progresses, a naive little conviction that life begins at conception affects public policy. Abortion>In vitro fertilisation>stem cell research>? We all know that creationist style beliefs about the age of the earth lead to politicians promoting nonsense in science classes. But what if a politician takes a short passage in Genesis 8:21-22 seriously? It’s exactly those words that lead Rep. John Shimkus, a member of the Energy and Commerce Committee, to dismiss global warming as problem. That’s what God told Noah, apparently. So, should the press assume that evidence-free beliefs will never become a matter of public concern because no one is legislating on them right now? Subjecting public figures’ style of thinking to skepticism and examination should not be taboo. If someone credulously accepts nonsense that’s important to know. The media should expect to be loathed. Politeness is never an excuse for the Fourth Estate. We’ll never know every issue that will confront us before we elect our representatives, which is exactly why appraising how they think is so crucial to voters. What is so extreme about the individual mandate? Somehow huge mandatory government interventions like medicare and social security survive most conservatives’ “literal” reading of the constitution, but an unenforceable fine for not buying health insurance establishes an unfathomable expansion of government authority. It’s clear that this seasonal crop of literalists are just constitutionalists of convenience – they don’t like Obamacare ipso facto it’s unconstitutional. Who knows, I’m not a lawyer either so I’m probably practicing a little motivated reasoning myself. But the case for constitutionality seems so simple to me that unless your committed to an absurdly strict reading, you should accept that Obamacare should stand. Anyone asking a version of the above question and looking for precise written permission for a Congressional power is arguing about the wrong document. 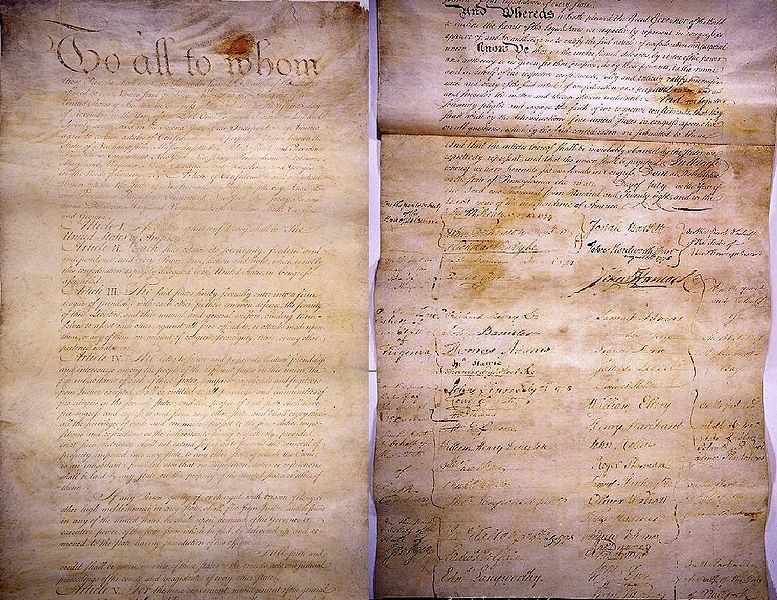 The Articles of Confederation limited Congress to the powers it “expressly delegated,” but when the Founders drafted the new Constitution the Anti-Federalists lost. The new document dropped the rigid wording and allowed Congress to pass laws that flow reasonably from the listed powers. More exactly, Congress may enact regulations that are “necessary and proper” to execute the Constitutional powers such as regulating commerce. Is the healthcare market commerce? To ask the question is to answer it. The healthcare market for insurance is obviously commerce. I’m not sure how that is even in dispute. Congress recognized that many citizens who want to buy insurance can’t, so made a regulation that forces insurance providers to cover people with pre-existing conditions. Most of the opponents of the individual mandate accept the premise that Congress can and should pass a regulation that prohibits pre-existing condition exclusions in insurance plans. If you accept that Congress can regulate the insurance and can make it illegal for healthcare companies to deny coverage to those with pre-existing conditions, than mandating that people should buy health insurance or pay a penalty is a “necessary and proper” regulation to execute the goal of coverage. Without the mandate, insurance companies could not reasonably cover enrollees with pre-existing conditions because of adverse selection and free-riders who would just jump into insurance once they got sick. Without the healthier people in the risk pool, insurance doesn’t work. Imagine if you could buy car insurance after you got in an accident. In Massachusetts, only once Mitt Romney’s individual mandate went into effect did the healthier citizens broaden the risk pool. 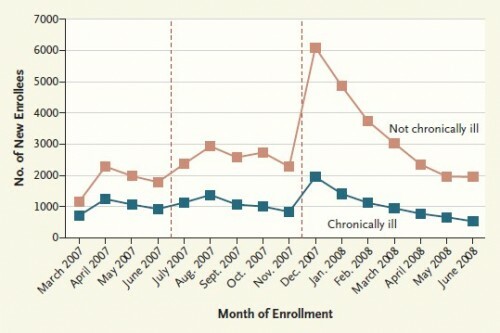 As you can see, when the mandate became “fully operational” [the 2nd dotted line] the “not chronically ill” enrollees (i.e. healthier people) joined the ranks of the insured en mass. The individual mandate is necessary and proper to address the market failure inherent in the insurance market for healthcare. As I stated earlier, I’m not a constitutional lawyer so it’s possible that the individual mandate will be struck down because of some legal technicality of, say, Congress not designing the mandate as an explicit tax, which has the exact same consequences economically. Maybe a majority of justices will find some quasi-theological distinction between activity and inactivity, but the Roman Fabius and the Taoist Laozi both teach us that non-doing is a form of doing. Opponents might not think that the policy tool is perfect, but Congress has the Constitutional power to address a market failure. The Supreme Court should uphold the mandate and give Congress reasonable scope to regulate commerce. If Obamacare is bad policy, elections can be the remedy. In honor of Paul Ryan’s fantasy budget let’s take a look at actual changes in government spending in this edition of Graphs that Subvert Conventional Wisdom. Sorry, those graphs cluttering your inbox from your right-wing uncle misled you. They fail to explain that the deficit is higher because the economy went into recession. GDP is smaller so spending when measured as a percentage of GDP appears like it’s jumped more than usual. The deficit is higher because of huge tax cuts by Obama, less revenue from a weak economy, a temporary stimulus and other measures to help people hurt by the recession. The 44th President hasn’t radically departed from those before him… turns out he’s actually been pretty modest. Ezra Klein has an insightful piece about the New York Times’ report that gene sequencing will soon become much more affordable. He argues it will sort purchasers of insurance into high cost and low cost groups too efficiently. Since insurance companies can’t discriminate based on genetic information by law, it will cause an unsustainable spiral. Eventually, genomic testing will be a powerful predictor of future illness. And it raises the potential that young people will get themselves tested and then purchase insurance based off the result. So those with a clean genomic result might go for a cheap catastrophic plan, while those with a high risk of developing pricey illnesses will opt for more comprehensive insurance. Undoubtably, Klein is correct. But I’d like to point out that this is already a flaw in a private insurance markets. Private insurance companies have no incentive to cover high-risk or sick people (unless under totally unaffordable and unrealistic rates). That’s why anyone that thinks insurers should cover people with pre-existing conditions must favor government intervention that requires healthy consumers to buy in and spread the cost out. 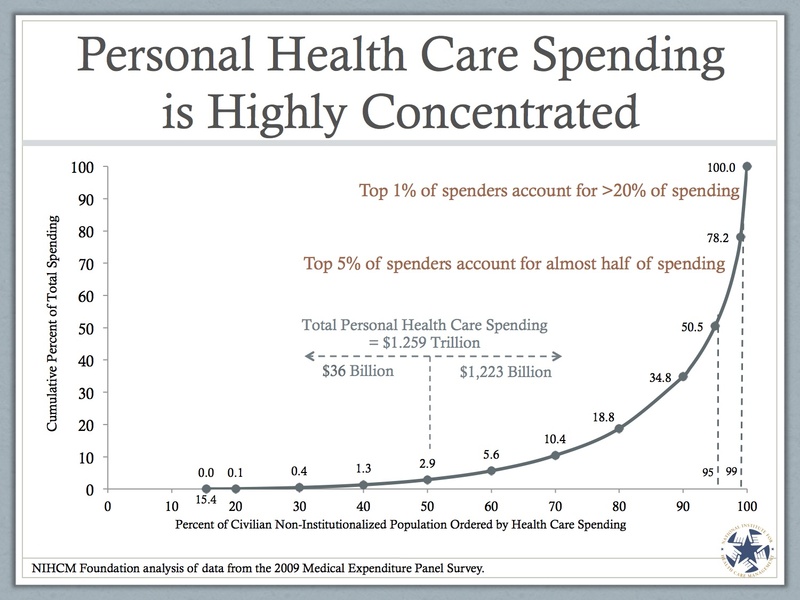 As the graph makes clear, the majority of healthcare spending comes from patients with chronic conditions (half of total spending comes from only 5% of the population). Unless the government covers those patients directly or spreads the cost out to the healthier population through mandates, we won’t have a workable healthcare model for treating the people who need it most. Well… unless you think charities can make up the hundreds of billions of dollars in shortfall? It’s important to shine light on crimes against humanity so I applaud the effort. I don’t know enough about the situation in Uganda so let me outsource some more nuanced coverage of this campaign and the LRA in particular. 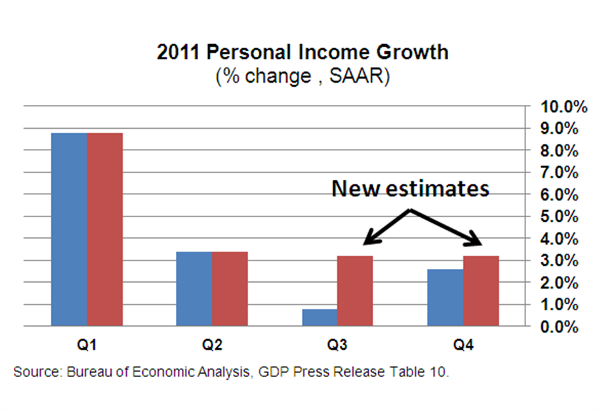 If personal income continues to on this path (it was revised upward as better economic data came in), the president will see 4 more years.